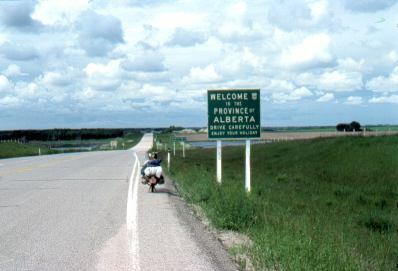 June 18, and I am heading into Alberta, two weeks after leaving Toronto. 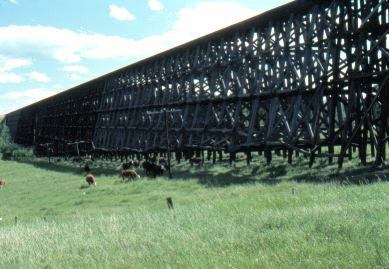 A huge old railway trestle. This is actually made of wood! 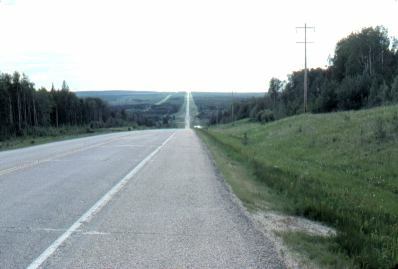 Typical country northwest of Edmonton: Forested and relatively flat, or undulating. There's a lot of oil and gas fields in this area. I stayed a couple of days at a place called Fox Creek. I was stuck while waiting for a replacement tire when the tire that was one my bike was damaged. Eventually I had to go back to the last town and found a tire there. The owner of the local motorcycle shop generously helped me out through this minor crisis. 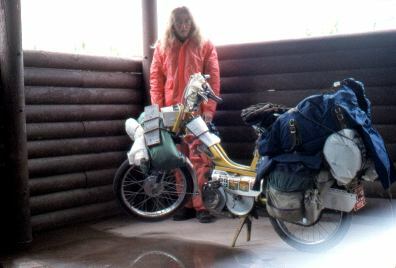 Here's a picture of me and the moped, in a picnic shelter waiting out some rain. Still in Alberta, northwest of Edmonton. The mighty Peace River. This is a northern farming and ranch area. 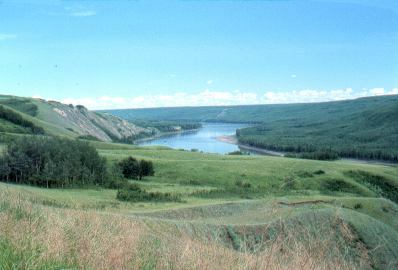 The Peace River has fashioned a truly huge valley for itself. I remember the first time I came upon it, going downhill for what seemed like miles, and then coming upon a sign that said there was a steep hill ahead, and then continuing downhill for what seemed like a couple more miles! 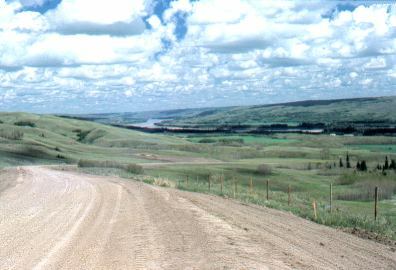 The Peace River is the only river to cross through the Rocky Mountains from west to east (the Rocky Mountains are west of here). 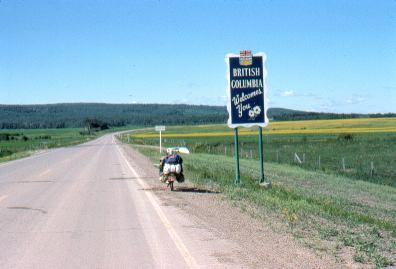 The British Columbia border, not far from the start of the Alaska Highway at Dawson Creek. This was on June 24, three weeks from the start of the trip.